The shapes of force–displacement curves recorded in single-fiber pullout and microbond tests are analyzed within the framework of a stress-based model of interfacial debonding. Three characteristic points allowing one to evaluate the local interfacial strength parameters, the local interfacial shear strength (IFSS), and the interfacial frictional stress, using several different methods, can be marked out in each curve. The “alternative” method based on the measured peak force and initial postdebonding force appeared to be more reliable than the “traditional” one using the debond force for calculating the local IFSS in fiber–matrix systems. 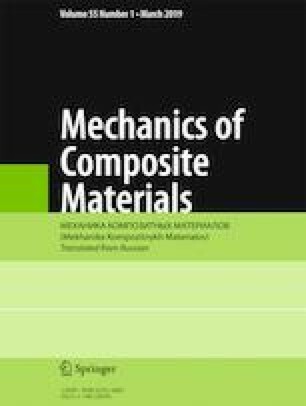 The effect of specimen geometry on force–displacement curves and on calculated local interfacial strength parameters was investigated. Though the “equivalent cylinder” approximation often yields a good estimate of these parameters, there is a need for a method which would explicitly include the actual specimen geometry. Russian translation published in Mekhanika Kompozitnykh Materialov, Vol. 55, No. 1, pp. 99-122, January-February, 2019.